I’ve posted how-to’s on beauty and makeup but I’ve realized that I haven’t posted about proper makeup hygiene. This is crucial because bacteria can harbor in makeup and brushes/sponges if not used or cared for properly. This can lead to eye infections, breakouts, and spreading germs. Eeek. So I’m going to go over some basics with you about your makeup’s shelf life (yes, just like food, makeup should be tossed when it’s reached its expiration) and how to clean and disinfect tools as well. Along the way I’ll answer some questions you might have already been asking yourself about your makeup. Ready to learn? Here we go! How do I know if this is expired? How does it smell? Stale? Has the color changed? Does it feel or go on different? Usually oil based products like lipsticks, and those that you touch with your fingers (such as concealer and foundation) are the first to go bad. These are exposed to germs and bacteria and should be checked regularly to avoid clogging pores and ruining your complexion. Ouch. Also anything that has a wand (that pumps air in) like lipgloss and mascara will last less than the rest. Is your makeup being left in your car or in the sun? Are you sharing your makeup with other people? These are quick ways to gather bacteria and spread germs. Heat can make bacteria grow on products like lipstick and mascara, etc. So avoid leaving your makeup exposed to the sun. 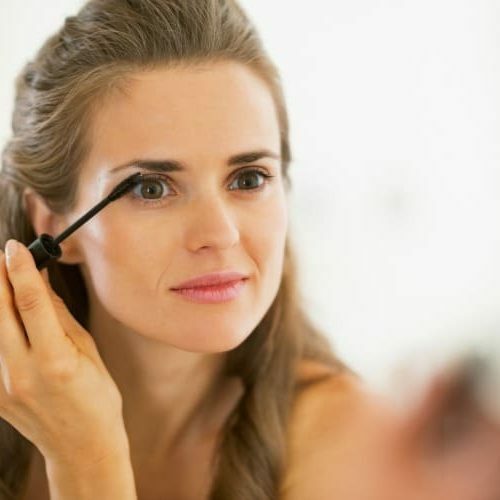 If you have an eye infection, avoid using any makeup at all to avoid contaminating it. Avoid creams and foundations in tubs, instead go for products with a pump or squeeze tube to keep it hygienic. How can I prevent the yucky stuff? A good way to prevent bacteria from forming in your products is to always wash your hands before dipping your fingers into anything that will touch your face. This also includes skincare like face cream, sunscreen, etc. 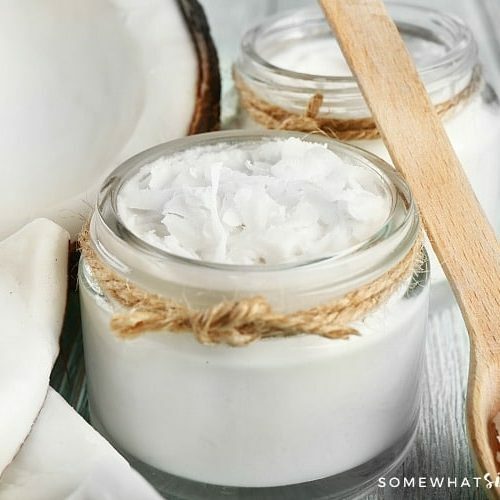 Once a product is opened bacteria can begin to form, that’s why most cosmetics have an Open Jar Symbol. This symbol lets you know how long you have from the day you open it before it goes “bad”. 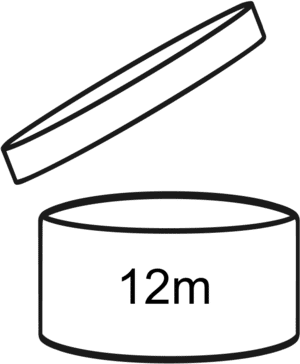 This symbol is usually on the bottom of products or on the outside packaging. So make sure you check the box it comes in before you throw it away just in case the product itself doesn’t have it. Another thing to avoid is sharing makeup with anyone, for obvious reasons. As far as pencils go, sharpen them regularly and you should be fine. These last the longest besides eye shadows. I’m not a big fan of sponges at all, brushes can be washed, disinfected and reused. But if you do carry a sponge in your compact or use one to apply your liquid foundation, make sure to toss switch it out every 2 weeks. Typically, most sponges aren’t very durable and can’t stand being washed but now there are some made to be washed which is great. 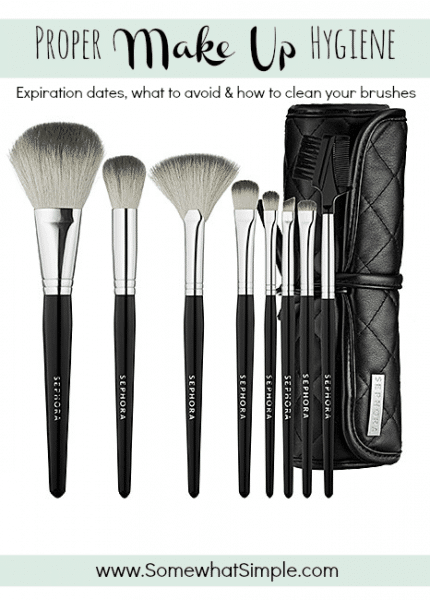 How often should I wash my brushes and how? I recommend washing face brushes (concealer, foundation, and powder) every 2 weeks. You can disinfect and clean them in between uses with a brush cleanser solution, wipes, or a spray. Several brands like MAC, Sephora, Make Up For Ever, and Bobbi Brown make them. Using a brush cleanser also extends the life of your brushes. And if you’ve invested in high quality brushes (that can last up to 10 years) which are quite expensive you want to get the most out of them. This is a great way to get your brushes clean quickly (most allow for a quick drying time) when switching colors or you’re in a hurry and don’t have time for them to dry. Eyeshadow brushes can be washed once a month or cleaned with a brush cleanser when switching colors. Lip and eyeliner brushes can be tricky to clean because they’re used with an oil-based lipstick, gloss, or waterproof liner, therefore you have to use an oil-based cleanser. It works wonders by disolving the product build up and conditions bristles nicely. 1. 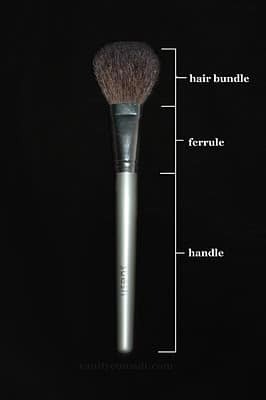 Run the hair bundle under lukewarm water making sure not to get water on the ferrule, especially where it meets the handle (this can loosen the ferrule from the handle or the hair bundle). 2. Add a pea-sized amount of baby shampoo (or any mild shampoo) to the palm of your hand and swirl the brush gently. Try to keep the brush straight up and down as much as possible to avoid getting water in the ferrule. You should see the color coming out right away, however if you have a lot of product build up use your finger to massage the shampoo into the bristles gently. The bristles can take awkward shapes and kinks if you wash to rough. 3. Rinse the brush (again, only the hair bundle). The color should be coming out of the brush, rinse until the water runs clear. To test and make sure all the color is out, swirl the wet brush in the palm of your hand pressing gently to see if any color comes out. 4. Dry by squeezing out excess water and swirling on a clean paper towel or face towel, shape the brush. ALWAYS dry brushes laying flat! Never in a cup facing up. These “expiration dates”are taken from the products I have, researching different sites, and personal experience. If you don’t use it as often or are careful how you use your products they can last longer. Be your own judge by smelling them, feeling the texture, and checking the Open Jar Symbol. *The “usually” means with regular use. Some of these products get used up before these dates and others just sit in a drawer forever so remember to look out for the tell tale signs. Hope you girls learned a lot- now go check your makeup stash! About the Author: Arleene Taylor is a professional makeup artist living in Orange County. She is a past Beauty & Fashion Contributor on Somewhat Simple who continues to share her passion on her site My Heartistry. You should really include a section that specifies do not use contour sticks for your face interchangeably on your body. I was disturbed when I came across a video of a woman doing a contouring tutorial and she used the same stick on her face, chest, legs and posterior. The most disturbing part is a large part of the audience thought it was okay. I don’t understand why people don’t understand its unhygienic. You are 100% correct! Thanks for your comment!!! Liked your article on brushes and sponges. I don’t wash mine frequently enough. I noticed that you suggested to use a “gentle” shampoo to clean makeup tools , like baby shampoo. Contrary to what people have been led to believe, baby shampoo is ususally not gentle to hair. The PH is alkaline like our lears. Hence “No More Tears” when it gets into eyes, but as you know, hair does best with an acidic shampoo to close the cuticle, leaving it smoother, softer, shinier.